We had a wonderful Thanksgiving at home with lots of family and friends and then along with Bo’s son, Trent, we headed to the river for a weekend of fly fishing. On Saturday we made a run up to Rim Shoals on the White River. 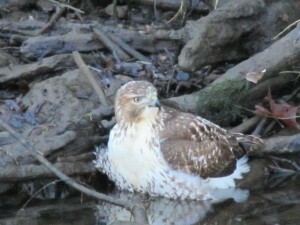 We spent fifteen minutes within three feet of the this young hawk while on the White River this weekend. We first thought he was tangled in fishing line or injured. We called the AGFC hotline to report a possible injured bird of prey. Eventually he walked about ten feet up the river bank then flew up in a tree. Then we called AGFC back and they too were glad he was in good shape. Guess he was just a young dumb Hawk. Anyway, it was pretty cool! It was a really windy day which made rowing a real challenge in trying to keep the boat in a good position to get a drag free drift on the fly. 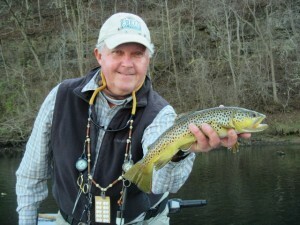 As you can see the guys still managed to catch some very nice Brown Trout. The top flys were a #14 Tobe Fly and a #20 Copper Zebra Midge. 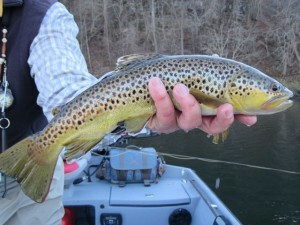 On Sunday we fished our home water, the Little Red River, and the wind was actually worse with gusts to 35mph. It was nearly impossible to get a good drift but we still managed a few decent Rainbows on #18 Crispy Creme, #14 Chronic and #14 Tobe Fly. 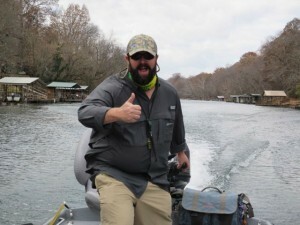 Trent, aka Uncle Trout, is sporting his winter beard and was the boat captain for the weekend. With that beard we may need to consider our own ‘Trout Dynasty” reality show!